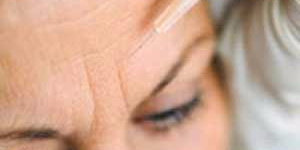 Botox is a botulinum A toxin designed to help eliminate or improve persistent facial wrinkles. This non-surgical procedure commonly treats areas like frown lines between the eyebrows, crows feet, and creases on the forehead through a number of tiny needle injections. Depending on where Botox is injected, side effects may include headache, respiratory infection, flu-like symptoms, droopy eyelids, and nausea. Temporary bruising on the injection site is also common. Facial pain, redness at the injection site, and muscle weakness are less frequent reactions. Small risk of allergic reaction. The effects of Botox injection will appear within 2-3 days, and peak up to 2-3 weeks and lasting about 4-6 months. Studies have shown Botox to relieve migraine headaches, excessive sweating, uncontrollable blinking and muscle spasms in the neck and eye. It is also used to help treat overactive bladders, control pain during operations, help children with cerebral palsy, prevent ringing in the ears, assist diabetics with weight gain and control drooling in some cerebral palsy patients. Outpatient – Usually in the surgeons office.